Though it is not easy to describe why Roche Limit is appealing, there is absolutely something enthralling about this series. 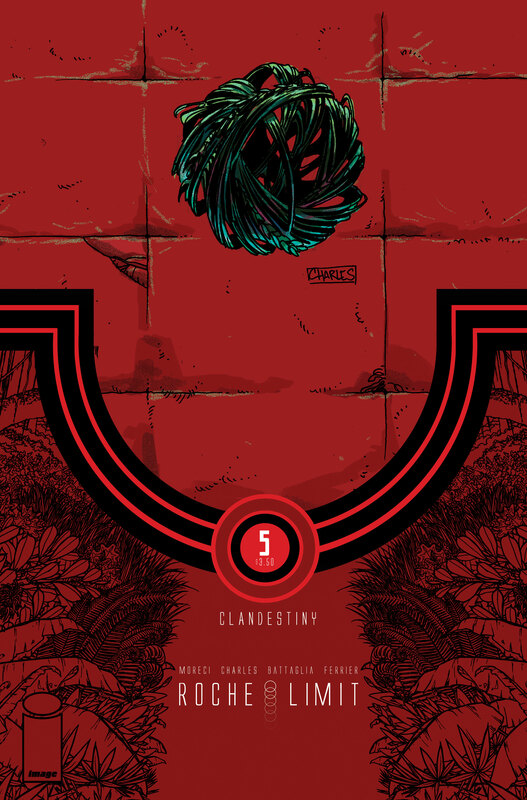 With a different look to the book through the art of Kyle Charles and Matt Battaglia’s colors, Clandestiny has been something completely new and incredibly dark. The final issue remains a balance of grounded and abstracted, pushing the series forward and leaving readers with much to consider until the next chapter. The story in Clandestiny #5 meets up with where the arc started, with Sasha exiting the ship and declaring that she will stay behind to face the monster. While it worked as a great tease to the start of the series, returning to it after so much has happened is a great choice that adds some weight to the present circumstances. The crew has dwindled significantly and those left are not sure just what they should do. Battaglia’s colors continue to be incredibly impressive as the book’s mood and reading experience are largely the result of these choices. Both Battaglia and Charles lend to some of the book’s strongest moments by finding a way to capture the scene in unconventional but impactful ways. The script Moreci has crafted for Roche Limit: Clandestiny is complex and yet the artists are able to provide so much in their visual story telling. In one incredible moment, as Sasha faces the monster the page slowly fades. First, the lines seem to disappear, and the colors leave forms of what was there, gradually decaying into a swirl of color. This fifth and final issue of the arc has some action-filled moments, but less so than the previous two chapters. Still, the suspense created through Moreci’s script and the evil that Sasha faces are nearly as gripping as those issues. Michael Moreci has crafted not only some interesting characters in this arc, but some very curious ideas. In that way, the final issue dances between an action story and the kind of philosophy only found in science fiction. Talk of souls, the mystery of the anomaly and just what the monster truly is all fill the pages of the book. As such, there is a lot of depth here. Moreci is dealing with intricate ideas, which don’t fully come to fruition by the end of the story. Roche Limit: Clandestiny ends with a very strange reveal. This entire arc has been very interesting and very dark, dealing with human emotion, desire, and ideation mixed with savagery and violence. Charles’s art has been a great fit, and Battaglia has brought a color palette to give the whole thing a fantastic sensation. In the final pages, even more mysteries arise and, with a teaser final page giving a glimpse at what comes next, the creators leave readers with a lot to swallow and much to look forward to.